Words by Serene Chai, photographs by ladyironchef. 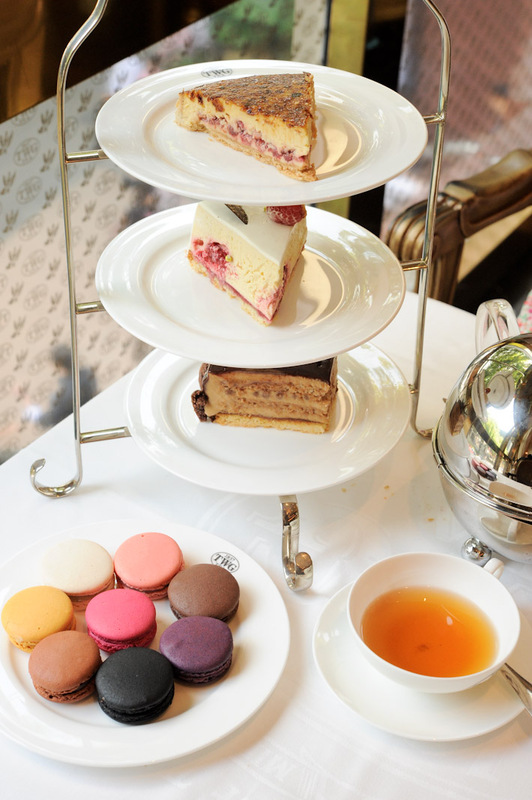 What is there not to love about high tea? As a fancy afternoon affair that is synonymous with decadent treats and heart-to-heart talks, it is beneficial for one’s weary soul. 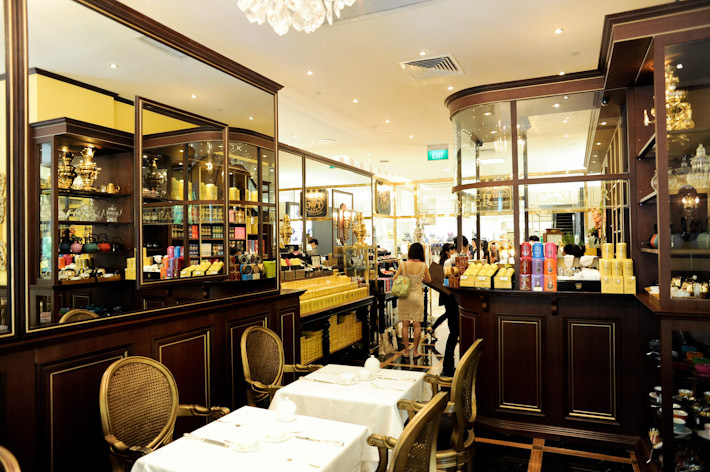 Unknown to many, TWG Tea Salon is a homegrown brand that has won over the taste buds of many tea and dessert lovers. Its growing reputation as a tea institution that offers a variety of exclusive and interesting tea blends and tea-infused delicacies has cemented its popularity in the local food scene. At first glance, you might be put off by the exquisite interior of the restaurant but TWG does offer affordable brunch sets. 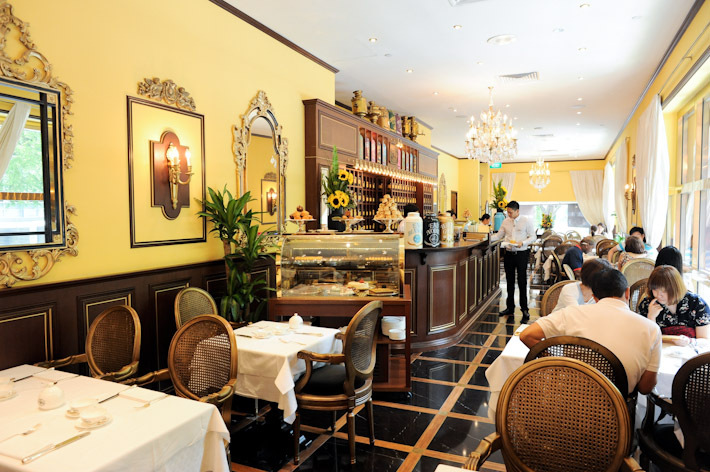 In addition, the friendly demeanour of its service staff and beautiful counter display of cakes and sweet pastries make it hard to resist the idea of dining with them. We started our afternoon on a savoury note with two of their brunch set specials: Emperor ($52) and Majestic ($56). There are six available brunch sets to choose from and what sets them apart is the choice of main course offered. 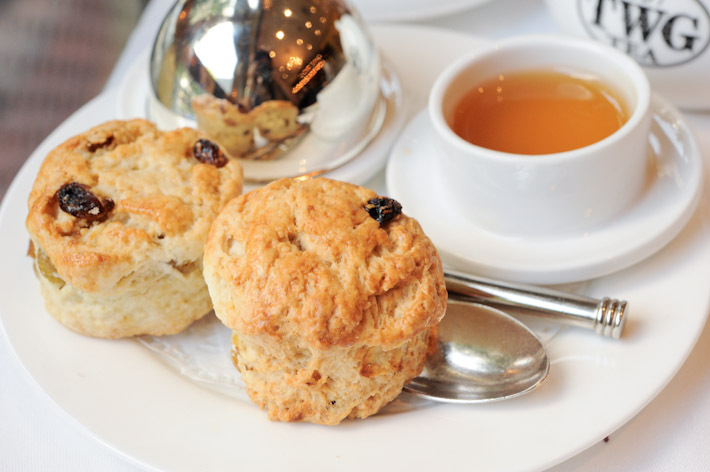 Each brunch set includes a main course, choice of 2 muffins or scones, a dessert, a choice of tea from their extensive tea menu and a glass of freshly squeezed juice. 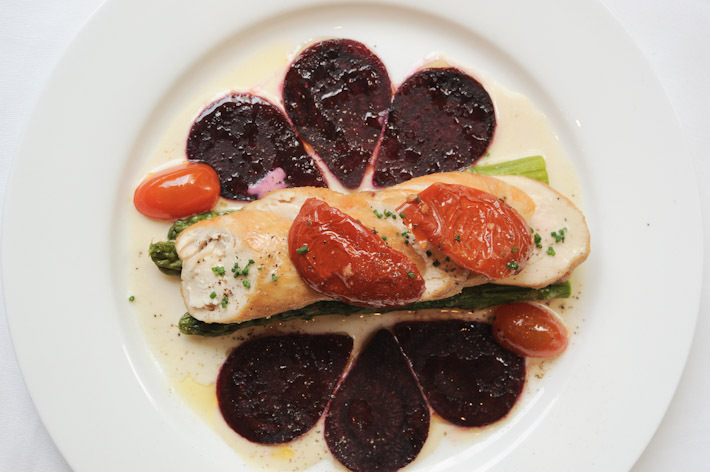 For the Emperor brunch set, we had the Chicken roulade with sautéed asparagus, roasted beetroot and tomato confit drizzled with a Napolean tea infused sauce. Fancy presentation aside, it was good but without the “wow” factor that I’d hoped for. As a seafood lover, I must admit that I enjoyed the main course that was served with the Majestic brunch set better. 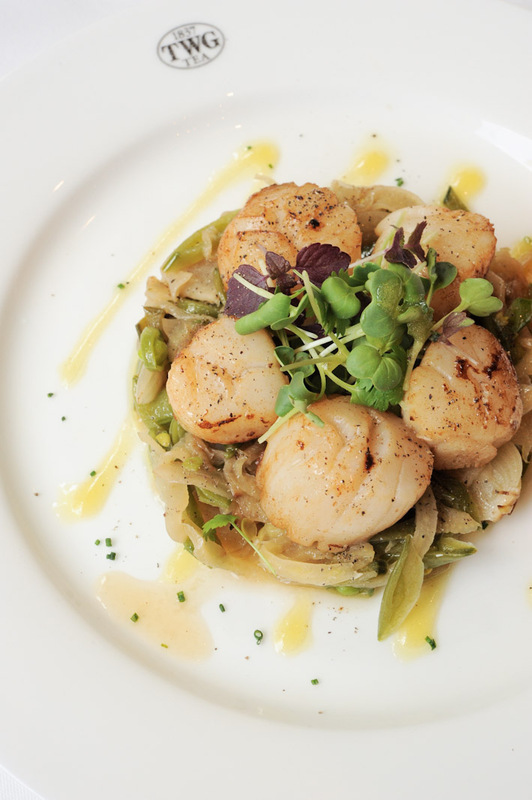 Think Pan-seared scallops accompanied by caramelized fennel and brunoise pea pods, garnished with baby-leaf herbs and a Caravan tea infused vinaigrette… The tea-infused vinaigrette sauce offered a refreshing twist to the dish. We also shared some scones, macarons (ordered separately) and cakes for a sweet ending to the afternoon. I appreciate how their macarons are infused with some of their signature teas. My favourite macarons among the colourful selection are the Morrocant mint tea macaron and Earl Grey Fortune & Chocolate macaron. That said, the other unique flavours are worth a try. Without a doubt, the TWG Singapore surprise is my favourite tea patisserie at TWG. A crème brulee tart filled with vanilla bourbon tea-infused cream and strawberries, I am not surprised that this is one of their best-sellers. Kudos to the creator of this brilliant slice of heaven! Although I’m not a fan of crème brulee, this dessert definitely hit the right spots. In my opinion, TWG prides itself on offering to its patrons a wholesome dining experience, which explains their immaculate service, amazing food presentation and lovely ambience. By the time we left the restaurant, I was already making a mental note of the tea patisseries that I’ll be ordering on my next visit. If you’re thinking of satisfying your sweet tooth cravings, here is another restaurant to consider.